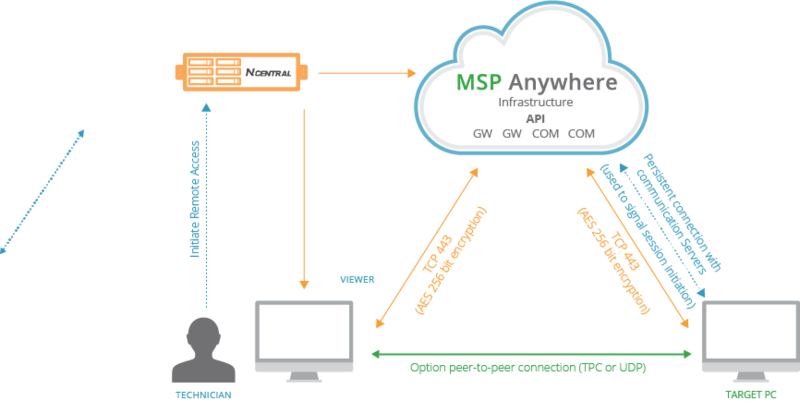 MSP Connect sessions are sheltered by a proprietary communication protocol with guaranteed global security by the Rijndael Advanced Encryption Standard (AES) using a 256-bit cipher (both when establishing or for the duration of the session). The key exchange is protected by an SSL based in AES-CBC with TLS v1.1. All commands, including keyboard and mouse strokes, file transfers and clipboard information are digitally signed. MSP Connect does not have access to session content. All encryption is based on an end-to-end negotiation that does not intercept transferred information or decode the information in the gateway. Encryption keys are randomly generated for each session. As an additional security measure, the client can configure an authentication method using a Master-Password or Windows Account and configure pre-authorization by the machine owner to launch the session. Finally, all major features, including remote control, file transfer and chat conversations are logged in the Session details and can be video recorded.